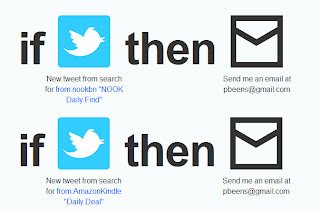 In response to @dougpete's request for our favourite ifttt tasks, I've posted a few that check the Kindle and Nook twitter accounts for daily deals and then email them to me. Here's a demo song called "Trouble", written by and performed by my son Michael's band Seedeater, from Seattle, Washington. I imagine any new material from Seedeater will be posted here: http://www.reverbnation.com/seedeater. Check them out! This iPhone is now sold. Thanks for all your interest! I am selling my mint condition 32 GB black iPhone 4. The phone is for the Bell Mobility network. I'm keeping my contract with Bell, but I've upgraded to a new phone and don't need this one anymore. It comes with the original box, also in mint condition, with all original accessories (AC adapter, sync cable, earbuds [unused]). If there's anyone out that wants a great smartphone for Bell Mobility but doesn't want to be committed to a contract, this is it! It would also be great for anyone who is in a contract but has damaged their phone or wants to replace it. For my Friends in or near Buffalo, today's Groupon is for the Albright-Knox Art Gallery - half price membership. Even if you'll only go a few times in a year, buy a membership to support the arts! Bell Laboratories computer scientist Dennis Ritchie, who passed away last weekend at 70, has left behind a legacy that includes inventing the programming language C and co-creating the Unix operating system. 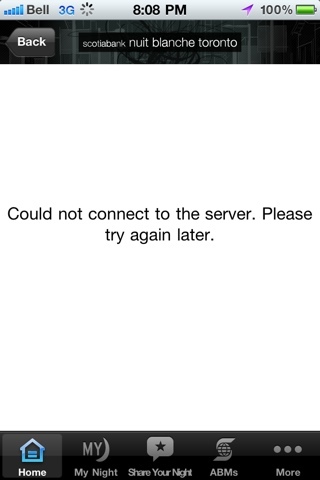 What's the point of the app if it can't connect to the server? Scotia Bank, you should have learned from your mistakes of the previous years and supplied adequate server capacity and bandwidth. Thankfully there were paper maps of the Nuit Blanche exhibits available, but in many instances it wasn't accurate nor provided adequate details to find the exhibits. Scotia Bank, for the resources you have available to you, you should be embarrassed by this. Really, how much extra would it have cost to supply a few extra web servers and rent some extra bandwidth?